On Sunday, March 31st, the Sunday Night Mixed League wrapped up their season play with awards presentations for both the First and Second half of the season. Pictured below are the winners in each Division. Special thanks to organizers Cathy MacDonald and Joyce vanBerkel, along with ice-maker Wayne Richards! On March 30, fifteen curlers from our Junior Program attended the New Glasgow Junior Bonspiel at the Bluenose Curling Club. We had two teams in U13 and two at the U19 level. Team Halloran placed 2nd overall and Team Verkoeijen was 3rd. Most importantly, our curlers had lots of fun playing other teams from the Bluenose and New Caledonia Curling Clubs. We look forward to hosting and playing more games against these clubs in the 2019-2020 season! As our regular season winds down I should relate that we had a very successful year-- we had 35 curlers in our Junior Program, split between U13 and U19 ages. Each week we worked on skills and gameplay all the while having fun and learning about curling. The success of the program rests squarely with my assistants, who each week helped deliver the program to the curlers. Nathaniel Smith, Victoria Rankin and Evan Perry were amazing to work with and I know the kids loved interacting with them. Thanks goes out as well to the Curling Club Board of Directors who have continued to support this program. Junior Curling is bringing in lots of new young people to the sport of curling, all of whom I hope will continue to play curling in the years to come. Congrats to the winning 2019 Mad for Plaid team - Cathy MacDonald, Roselle Lawlor, Margie Vande Weil and Ginny Webb. Second place was the team skipped by Jo-Anne Doiron and third place was the team skipped by Jackie MacDonald. A huge thank-you goes out to Colleen MacDougall for organizing this successful women's bonspiel each year! The first half of the curling season is over already and many league teams are changing and preparing for the second half. Pictured below are winners from the first half. Best of luck in 2019! Thursday SeniorsThird place winners L-R : Ron Chishom(spare), Dave Smith(spare), Randy Burns, Joe Martell. Missing from photo Paulette Tate and Helen Layes. On December 15, the Highlander Curling Club held a Junior Bonspiel with Teams in attendance from the Bluenose, Highlander and Chedabucto Curling Club. Lots of friends and family were on hand to cheer our youngest curlers on as they played their games. Each game was 5 ends long and full of excitement and great shot making. The overall winners of the Tournament were from the Bluenose Curling Club. Team members from the New Glasgow based rink included: Jack Higdon, Conrad Roberston, Joe O'Neil, Cullen Park and Ben Hingley. Congratulations to all the participants. It was a great learning experience for our teams and lots of fun was had. A big thank you goes out to Jim Marlow and Wayne Richard for having the ice in tip-top shape. Also thanks to the parents of our curlers who brought food, got the kitchen ready and helped clean up afterwards. Couldn't have had as good a bonspiel without you! 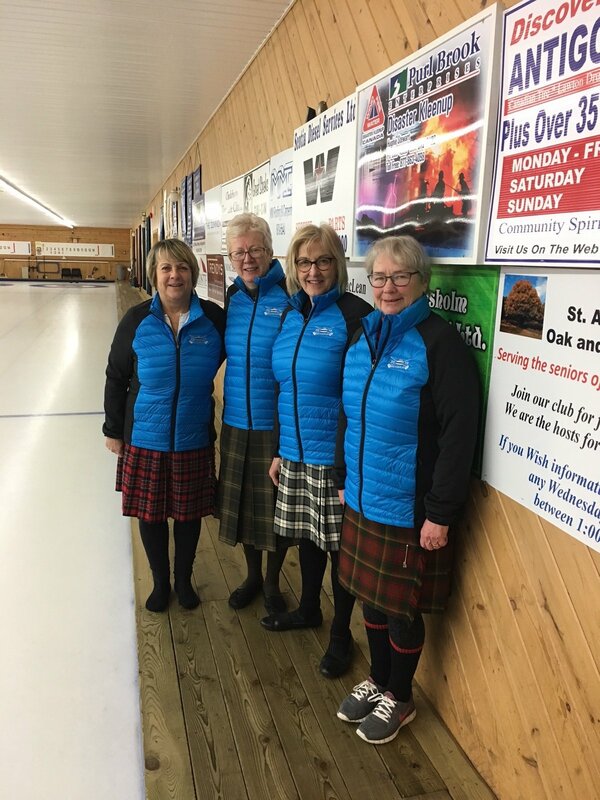 The Highlander Curling Club was pleased to host the 2018 Nova Scotia Women's Qualifier from December 6th-9th. Teams from all across Nova Scotia attended to earn a birth in the Nova Scotia Playdowns. Six teams advanced from this event to round out the eight team pool. HUGE THANK YOU to all of those who helped make this event so wonderful! We received nothing but praise from participants and visitors! Job well done!! What's New with Junior Curling? On Friday October 19th Donelda Mattie ran a Refresher Clinic for our Under 11 Returning Curlers. This was a great chance for those younger curlers to get the rust off the rocks and brooms before the regular program begins. See images from this event below! Another curling season has concluded with Highlander Curling Club teams competing for their respective League Championships. Pictured below are award winners for both Tuesday Night Ladies League and Thursday Night Mixed League. A huge thank you to all those who came out to participate in the Curling Fun Day today! The numbers were well over our expectations so THANK YOU! And of course thank you to all of the volunteers who helped make it the success it was. If you have any questions about renting the ice or participating in a league (either as a spare or regular member) please contact us via our Facebook page or website. Below are a few pictures from a great day! We look forward to seeing all these new faces around the rink again soon! The Highlander Curling Club's first leagues started in 1992. It was built almost entirely by volunteers and continues to be run to this day 100% by volunteers. The Highlander Curling Club has hosted many high calibre events including the Nova Scotia Scotties playdowns, Men's Tankard playdowns, provincial junior qualifiers, Provincial Seniors Mens & Womens, AUS championship among many others. NOTE: Highlander Curling Club does not accept credit or debit.